There are reports of Taliban targeting candidates of ANP, MQM, PPP and other political parties in the country, including in Karachi, the economic hub of the nation. There's also talk of millions of new young men and women voters who may tip the balance in PTI's favor if they do turn out to vote. Who will be the winners and losers in the coming elections? Watch the show to find out! Viewpoint from Overseas host Faraz Darvesh discusses with Riaz Haq, Sabahat Ashraf (iFaqeer) and Ali Hasan Cemendtaur upcoming Pakistani Elections 2013, Taliban in Karachi, and rejections by Election Commission of Pakistan. This show was recorded at 12:30 pm PST on Thursday, April 4, 2013. Pakistan Elections 2013: How Will Taliban Violence and Youth Vote Impact Results? from WBT TV on Vimeo. Who Will Win Pakistan Elections 2013? Imran Khan's Fall and Ali Haider Gilani's abduction. from WBT TV on Vimeo. Who's Better For Pak Human Development? I can understand English and Urdu titling of the video. But why are you providing translation in Bangalee? Yes, if we had provided Bangalee translations before 1971, we might have prevented the partition. But what is use of involving Bangalee now? A bit late, don't you think? HWJ: "Yes, if we had provided Bangalee translations before 1971, we might have prevented the partition. But what is use of involving Bangalee now? A bit late, don't you think?" First, it's not Bengali. It's Hindi. Why? Because India consistently shows up among top three sources of readers of my blog, along with visitors from US and Pakistan. Second, Bengali was an official language of Pakistan until 1971 and all Pak govt documents were in Bengali as one of two languages. ^^RH: " There's also talk of millions of new young men and women voters who may tip the balance in PTI's favor if they do turn out to vote." PTI does not stand a chance. It will always be around the level of the Muttahida Majlis-e-Amal, no more. Any claims of anything more is merely dream-selling. Pakistani politics is really divided along Punjabi, Seraiki, Sindhi, Pashtun & Muhajir lines. Everyone else is either too small, or too geographically dispered, or both, to really matter. The total ROUT of PML(N) in Sindh and Balochistan shows that people view the Nawaz faction as a "pure Punjabi" party. PML(Q) does a little better in Sindh and Balochistan and so could bew viewed as weakly sort of National-level political party. So we can conclude that if the people at angry at PPP government at National Level, they best they can do is vote for PML(Q), as that is the only reasonable National level party left. If they vote for any other party, their votes might get diluted and the PPP will come back again in another coalition much to their sorrow. Note that the religious-parties front (MMA), although not-ethnic oriented, gets a few seats in Pashtun and Baloch areas, and barely holds on in Punjab, but is totally wiped out in Sindh. SUMMARY: There are only TWO parties that can (in coalition of course) truly lead a NATIONAL government--- PPP & PML(Q). PML(N) is essentially a Punjabi-establishment party and has NO support outside the "pure punjabi" circles. Do you agree/disagree? Please comment so that we can further debate this issue. HWJ: "PTI does not stand a chance. It will always be around the level of the Muttahida Majlis-e-Amal, no more. Any claims of anything more is merely dream-selling." Imran Khan is quite popular among young voters across the country. Polls show substantial support for him in Punjab and KP. If the youth do turn out in large numbers, PTI could emerge with as many as 30 to 40 seats... a substantial number to influence policies in a parliament where no single party is likely to have a clear majority. As to PML (N), I think Sharif Brothers are very parochial. They have trouble seeing anything beyond the vicinity of Lahore and Raiwind. One measure of it is how they have been spending development funds for the last five years, and in their previois stints in office. For the last five years a strange drama is being played out by the Election Commission of Pakistan to support the biggest crooks in the land. This relates to supporting hundreds of those parliamentarians that forged their degrees in order to become eligible to contest the elections in 2008, and then looted thousands of billions of rupees after coming into power. According to Transparency International of Pakistan, a colossal sum of Rs18,000 billion (that is Rs100 crores repeated 18,000 times over!) was looted by those in power in the last five years, drowning the country in debt. This amounts to about 180 billion dollars. Considering that we have been quibbling over aid from the USA that is only about 1-2 billion dollars annually, it shows the magnitude of what has been actually going on in the country. Pakistan has been skimmed dry and is today essentially a bankrupt country. We will be unable to pay the next installment due to the IMF unless we can get a loan from somewhere to help us do so. All this went on under the nose of our judiciary and the army who watched helplessly as the loot and plunder continued unabated. Many Neros were just playing with the fiddle while Rome was burning. The Election Commission even ignored the orders of the Supreme Court issued about four years ago to have the degrees of the elected ‘gentlemen’ verified and looked the other way while daylight robberies on our national exchequer continued. The acute poverty that has resulted across the country has aggravated the law and order situation. A former prime minister has been charged with massive corruption involving the hiring of obsolete power generating plants at exorbitant prices. The cost of power generation from these plants is over Rs50 per unit as opposed to Rs6-8 per unit from other plants. Money has been transferred under hand to foreign bank accounts while industries have been devastated. Had the Election Commission done its job five years ago many of these crooks that ruled us would not have been able to perform their villainy. What is alarming is that the ‘save the crooks’ approach still continues and attempts are being made to allow these very fraudsters to escape from scrutiny and participate in the next elections. This scheme has been recently exposed in a letter written by the chairman Higher Education Commission to the chief election commissioner; it has also been sent to the chief justice of the SC. The Election Commission, apparently bowing to political pressures, has cleared 27 of those members of parliament that had been found to have fake degrees. It may be noted that the ECP has no legal right to declare degrees fake or genuine. The HEC is the only institution that has these powers and the step taken by the ECP to declare the degrees as genuine after the HEC had found them to be fake and declared them to be so is illegal. The HEC has formally informed the ECP of this vide its letter of March 4, 2013. The Supreme Court should take suo motu notice of this and if it is found that the Commission is guilty and continuing its ‘save the crooks’ policy, then a new commission should be constituted. Pakistan is at a crossroads. We may be able to save this country if we can get clean people in the government and there is a huge responsibility on the Election Commission of Pakistan to ensure this. Alas it appears that the Election Commission is continuing its ‘save the crooks’ policy and failing to honour its own commitment – that it will take criminal action against all those ‘gentlemen’ who continue to refuse to produce their documents for scrutiny. There are 189 such persons who have refused to do so till today and the Election Commission continues to look the other way. This is a national shame. BAJAUR AGENCY, Pakistan - "My sole motive is to serve my people, especially women who have had no role in politics so far. I feel we can make progress only by bringing in women into mainstream politics." These are the words of Badam Zari, 40, who has filed her nomination papers with the Election Commission of Pakistan (ECP). Zari is contesting from the militancy-hit Bajaur Agency, one of the seven districts in the Federally Administered Tribal Areas (FATA) near the Afghanistan border. Zari's tiny but lush green house in Arang village is buzzing with activity as women from the neighborhood come in droves to congratulate her for the exemplary courage she has shown in standing for elections. In January this year, the Election Commission of Pakistan proposed an amendment to the Representation of People Act, 1976, making it compulsory for every polling station to have at least 10% of its total votes cast by women. It went so far as to suggest that results from polling stations not be taken into account till that provision was met. The government, however, paid no heed to the suggestion. "I am extremely worried about tribal women, most of who stay in their houses, which has prevented them from making any progress," Zari told IPS. "My only ambition is to struggle for the improvement of women's conditions in Bajaur Agency. Women here are suffering as none of the lawmakers in FATA have ever worked towards their development." ISLAMABAD, Pakistan — The most popular politician in Pakistan's largest party won’t be staging any rallies or participating in debates as May’s historic national election nears. Yet Benazir Bhutto, assassinated more than five years ago, is still the standard-bearer of the Pakistan People's Party. In its TV commercials and banners, she has been pushed to the forefront of the party’s uphill campaign to return to power in Parliament after a widely criticized five-year term. Hers is the face of the party on its official manifesto. She looms over smaller photos of her widower, President Asif Ali Zardari, and their son Bilawal Bhutto Zardari, who lead the party but are rarely seen in public. The PPP’s campaign in the run-up to the May 11 vote has been proscribed by security concerns. The Pakistani Taliban, which asserted responsibility for Bhutto’s death, has warned the secular party that its candidates and rallies will be attacked. In recent weeks, the militants have killed several leaders and workers in the parties that formed the PPP government’s ruling coalition. That may be part of the reason that Bhutto, who served twice as prime minister and was Pakistan’s only woman premier, has become a constant presence in the race. Bhutto Zardari, 24, is too young to run for a seat in the May 11 election — the minimum age in Pakistan is 25. In a video released Tuesday, the party heir reassured voters that he “wanted to launch the election campaign in the streets of my country alongside my workers,” but he said it was too dangerous. “Once again the enemies of peace and prosperity are standing in front of us,” Bhutto Zardari said. So the party is left with only ghosts to burnish its image. In campaign ads and on placards, Benazir Bhutto is always clad in a fashionable head scarf — in some photos merely casting a serene gaze, in others raising an arm forcefully, as if at an eternal rally. The latter image has been paired with one of her son giving a victory sign. In placards hung around the capital, Islamabad, touting one of the party’s National Assembly candidates, Bhutto takes the top position — usually reserved for living candidates for prime minister in other parties’ signs. The PPP’s signage and literature also rarely fail to invoke the memory of her father, Zulfiqar Ali Bhutto, who founded the party and later served as Pakistan’s premier and president. Both of them are bestowed the title “shaheed,” or martyr, whenever mentioned in party speeches and materials. Zulfiqar Ali Bhutto was deposed in a 1977 military coup and hanged two years later. Today his stolid visage is also an election-season staple, as the party makes a direct photographic appeal to his legacy as a socialist reformer. “You would hear people say, ‘I will vote for his grave, even, because of what he did for me,’ ” said Usman Khalid, a former Pakistani army brigadier general who resigned to protest Zulfiqar Ali Bhutto’s execution. Khalid, 78, runs a one-man Pakistani political party — based in Britain and existing on paper only — and comments on events. He said he knew both Benazir Bhutto and her father and understands the point of the current ads. Pakistan can be an unpredictable place. But in a chequered history that has kept lurching from crises to coups, one event has kept coming back, with reassuring certainty - elections. I've covered almost every one of them since 1988 when martial law abruptly ended and a people who fought for democracy directed their energies and enthusiasm towards the battle for ballots. What boisterous campaigns there've been - massive rallies that packed stadiums and fields, convoys of vehicles snaking, horns blaring, through villages and down highways - a chaotic carnival in every constituency. But elections in Pakistan can't be like that anymore. It's simply too dangerous. Not a day goes by without a report of an attack by one of many armed groups on a politician, or a public space, or the police. I'm back in Pakistan to find out what it's like to campaign in "Elections 2013", and what it takes to win. The crush of massive crowds has mostly been replaced by "corner rallies". Politicians travel across the land in helicopters on carefully guarded schedules, rather than spontaneously weighing into the fray. Something has been lost. But something else has been gained. A different kind of explosion has transformed the political landscape here. There's a dizzying array of television channels in all the languages spoken here. And social media provides the safest of places to argue and analyse, and of course to jockey for influence and joke. It wouldn't be Pakistan if they didn't. Many worry about "saving Pakistan" - from the blight of official corruption, growing violence and extremism, deepening divisions. That's on top of the age-old problems of poverty and illiteracy. Everyone talks of "change". Everyone has waited a long time for it to happen. Will it come, this time, from within the parties which traditionally dominated politics or will it usher in the rise of new political dynamic? Yet again, this is an election where people warn that Pakistan "at a crossroads", is facing a "last chance". Despite all the threats and disappointments, every person I have spoken to - so far - told me: "Yes of course I am voting!" Pakistan always seems to get another chance. And yet again, you sense that at least the people want to seize it. 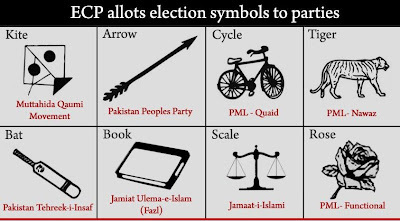 RAWALPINDI: As Taliban bombs curtail campaign rallies, Pakistan’s political parties are ploughing millions of dollars into TV and print adverts to sway voters ahead of next week’s historic polls. Competition is fierce but it’s a cash market and those with the biggest bucks get the most air time ahead of the historic May 11 polls, set to mark a key democratic transition, say television executives on condition of anonymity. Bursting with colour, promising to fix the nation’s myriad ills, bust corruption and bring prosperity to voters, the “paid content” ads are broadcast day and night accompanied by the upbeat, nationalist jingle of campaign songs. Unlike Internet access, which is still limited, more than 60 per cent of the 180 million population have access to TV, according to the Pakistan Advertisers Society. For medium-sized channels, an average minute of advertising costs $460-500 during 6pm to midnight prime time or $250-300 earlier in the day, according to one television insider speaking on condition of anonymity. There are around 80 channels in Pakistan, although the market is dominated by little more than a dozen with rolling 24-seven news coverage. “On average a television channel airs up to five minutes of political ads an hour,” said the television insider. The outgoing PPP gives prominence to former prime minister Benazir Bhutto, showing footage of her 2007 assassination and anointing her son Bilawal – still too young to contest the vote – as the country’s future. The main opposition and frontrunner PML-N lionises its leader Nawaz Sharif as a statesman and a developer, the man who knows how to fix the economy, the man beloved by a sea of flag-waving crowds. Ads for cricket star Imran Khan – looking to make a breakthrough at the May 11 polls – offer voters a “new Pakistan” with his PTI party symbol – a cricket bat – swiping away the corruption and jettisoning the country into the future. With Taliban threats against the main outgoing parties, Khan and Sharif are the only party leaders to address traditional public rallies in person. Ad men consider the election a two-horse race in which the PPP – rudderless without Bhutto and her son too young to run for parliament – has deliberately taken a backseat, consigned to a stint in opposition. “It’s PTI and PML-N who are the highest spenders,” said Bilal Agha, general manager for Dawn News television. When Veero Kolhi made the asset declaration required of candidates for Pakistan's May elections, she listed the following items: two beds, five mattresses, cooking pots and a bank account with life savings of 2,800 rupees ($28). While she may lack the fortune that is the customary entry ticket to Pakistani politics, Kolhi can make a claim that may resonate more powerfully with poor voters than the wearily familiar promises of her rivals. For Kolhi embodies a new phenomenon on the campaign trail - she is the first contestant to have escaped the thrall of a feudal-style land owner who forced his workers to toil in conditions akin to modern-day slavery. "The landlords are sucking our blood," Kolhi told Reuters at her one-room home of mud and bamboo on the outskirts of the southern city of Hyderabad. "Their managers behave like pimps - they take our daughters and give them to the landlords." To her supporters, Kolhi's stand embodies a wider hope that the elections - Pakistan's first transition between elected civilian governments - will be a step towards a more progressive future for a country plagued by Islamic militancy, frequent political gridlock and the worsening persecution of minorities. To sceptics, the fact that Kolhi has no realistic chance of victory is merely further evidence that even the landmark May 11 vote will offer only a mirage of change to a millions-strong but largely invisible rural underclass. Yet there is no doubt that hers is a remarkable journey. A sturdy matriarch in her mid-50s who has 20 grandchildren, Kolhi - a member of Pakistan's tiny Hindu minority - is the ultimate outsider in an electoral landscape dominated by wealthy male candidates fluent in the art of back room deals. Possessed of a ready, raucous laugh, but unable to write more than her name, Kolhi was once a "bonded labourer," the term used in Pakistan for an illegal but widely prevalent form of contemporary serfdom in which entire families toil for years to pay often spurious debts. Since making her escape in the mid-1990s, Kolhi has lobbied the police and courts to release thousands of others from the pool of indebted workers in her native Sindh province, the vast majority of whom are fellow Hindus. On April 5, Kolhi crossed a new threshold in her own odyssey when she stood on the steps of a colonial-era courthouse in Hyderabad and brandished a document officials had just issued, authorising her to run for the provincial assembly. According to the Election Commission of Pakistan, there are around 800 Jewish voters registered in Pakistan out of which 427 are women and 382 men. This statistic seems odd because there are almost no Jewish people in the public sphere in Pakistan and they are not even considered as a minority group during policy discussions. Historically, thousands of Jews were part of Karachi’s population at the time of Independence. Pakistan hasn’t treated its minorities well and Jewish people were not the only group to be neglected by the state. Another factor that needs to be considered regarding not just the Jewish voters but our political and intellectual culture as a whole is the prevalent anti-Semitism (here it is strictly taken to mean anti-Jew) in the country. Mehdi Hasan, a former editor of a British newspaper, recently wrote about the “banality of Muslim anti-Semitism”. He mentioned how Lord Nazir Ahmad blamed a traffic accident that he was involved in and his subsequent conviction on a Jewish conspiracy during an interview with an Urdu channel. For the political right, in Pakistani, blaming the ‘Jews’ is an established norm. According to Bernard Lewis, the anti-Semitic ideas of the Christians first entered the Muslim world because of Islam’s conquest of Europe, which resulted in many Christians converting to Islam. Prejudices existed in the Islamic world, as did occasional hostility, but not what could be called anti-Semitism, for there was no attribution of cosmic evil to the Jews. Greek Orthodox Christians who found themselves living under Ottoman rule are said to have introduced the notion of the blood libel into the Middle East. One of the most notorious books cited by people believing in the ‘Jewish’ conspiracy theories is the ‘Protocols of the Elders of Zion’. It is a collection of articles concocted in 1895 by the Russian Czar’s secret police in order to depict the growing strength of Marxists as a Jewish conspiracy. PML (N) may end up with the largest number of seats but it probably will not be able to put together a coalition. This will likely open up an opportunity for the PPP to form the next govt. So there's very little chance of better governance in the next 5 years. Imran Khan (PTI) will most likely sit in the opposition with 30-40 seats....a substantial number to be able to influence laws and policies. Let's check back in a few days. The following blog post and the TV show were recorded in Aug 2012 before the Taliban started to selectively attack PPP, ANP, and MQM. Since then, ANP's chances have significantly diminished but PPP and MQM still remain strong in their respective strongholds. The PPP-MQM-ANP bloc can still prevail and form the next govt because the right-wing (PML N, JI, JUI, and I include PTI in that as well) in Pakistan is deeply divided with each party fielding candidates against others. If the result goes as I predict with PTI getting 30-40 seats (substantial in my view), then I fear that Imran Khan's folks will cry foul. But it'll be a test of IK's leadership to cool tempers and work to improve the system and hope that the next election could make PTI a big winner.